Best dive-season / How to get there: International flights reach Cebu airport, from there it's an 1 1/2h drive to Moalboal. Local dives shops reach the sanctuary within minutes by local Banka boat. This dive site south of Panagsama Beach offers a nice drift dive, where the boat follows the divers to their exit point. Tongo point offers many small caves and overhangs that often host turtles. 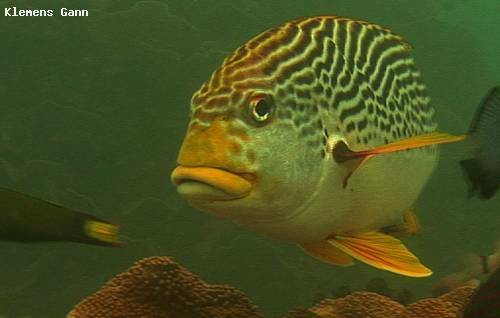 The reef shelf is very shallow around 3m and home to many juveniles including batfish, sweetlips, groupers and angelfish. Along the wall you see big gorgonian seafans which sometimes host pygmy Seahorses (Hippocampus Denise). Schools of big mouth mackerel and needlefishes are seen in the blue. Along the wall lots of razor fish are hovering over black corals and sometimes schools of squids are seen in the distance.